Walruses have a thick layer of blubber to keep them warm and to provide energy. When a walrus is underwater, their heart rate slows down. Also, muscles in their throat will close up to prevent water from getting in their lungs. 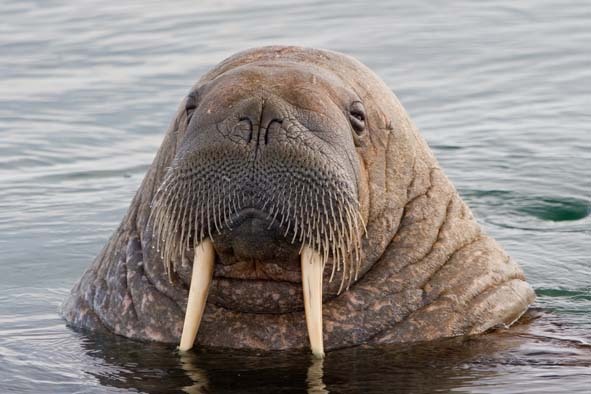 A walrus’s only predators are orca whales and polar bears. A penguin is warm blooded. They have a thick fat layer under their skin to help keep them warm underwater, and it is a good source of energy. 30% of a penguin's body mass is blubber. The combination of fur and feather helps to keep the penguins extra warm. Their feathers are unlike any regular bird feathers. There is a short under layer of fuzzy feathers to keep water from getting to their skin. The water will just slide off. When a penguin is cold, it will puff out its feathers for better insulation. The dark feathers on a penguin absorb heat. Penguins have more density of feathers than any other bird! When there is a blizzard, up to 6,000 penguins all huddled together to stop the wind. Some penguins can balance on their heels and tails to keep their body from touching the ice. A polar bear is covered in two coats of long, thick fur. They have over four inches of fat. A polar bear will sometimes swim to cool off. A polar bear's foot has hair and bumps on it to keep it warm and to have better traction on the ice and snow. Also, a polar bear has so many ways to stay warm that it has to be careful not to overheat! An arctic hare’s body is very small so it can maintain most of its body heat. Also, they have very thick fur. An arctic hare has very good camouflage, too. They have very long and powerful feet to help keep them from sinking into the snow. 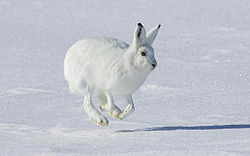 Also, an arctic hare can run at up to 40 mph if a predator is near. Some of the arctic hare's predators are, the arctic fox, red fox, grey wolf, and Canadian lynx. An arctic hare can spot a predator from very far away. They have great vision and long black eyelashes that act like sunglasses to keep the sun out of their eyes.